I finally finished Chapter 3 in the Bert Dodson book Keys to Drawing!!!! These two pages were done and should have been uploaded yesterday, but I was too tired after a very long (7:15AM-9PM), but wonderful, day with two of my grandsons. Eight month old Zach is crawling really fast and pulling up on anything, even trying to climb, so he requires constant attention. But he is a really happy baby - and it is wonderful watching his development. Four year old Robbie is a master builder of extremely complex multiple level Geotrax train systems and can build for hours when he comes home from pre-school. He has a wonderful design imagination and is extremely fast - and when he finishes another complex track he usually has 5-6 remote controlled trains navigating the system at once. The first drawing is of a foreshortened head. I did it using a light grid because I knew it was the only way for me to capture even a slight resemblance to my pretty grand daughter Sydney - who was eating a snowcone when I took this photo. This page show some emphasis of facial characteristics which is the final page (but not a project) in Chapter 3. These were all drawn from faces in my figure drawing group this week. 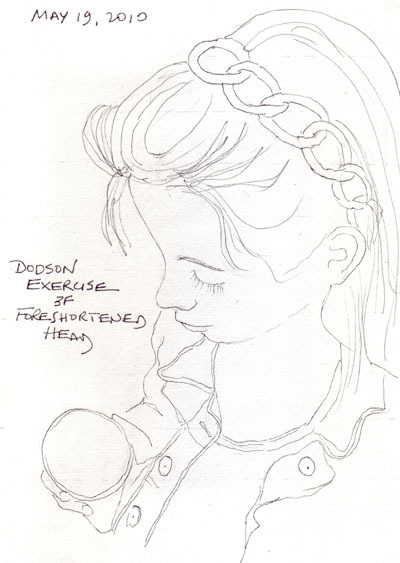 There are 5 more chapters in the Dodson book - which is a very sophosticated full course in drawing. I was stuck at one place in Chapter 3 for too long and will try to make more continual progress. But I have no deadline and learn so much from the projects. 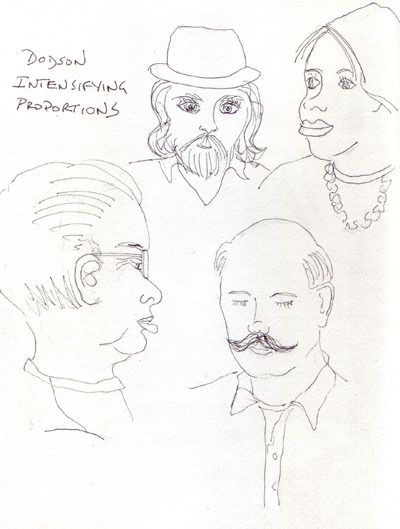 Last night I went to Figure Drawing at the Society of Illustrators in New York City. I think some of the people that I see there regularly go twice each week. I'd love to go twice each month, but will probably never go more frequently than that. This time I took my 9B woodless pencil and stumper that I played with when I was reading Bill Rankin's Fast Sketching Techniques book and loved using them for the longer poses. Here is one page for 2 min, 5 min, 10 min, and 20 minute poses. My new sketchbook is slightly bigger than my scanner and the person sitting next to me created charcoal dust periodically that drifted onto my page - so I cleaned them up as well as possible. I blocked out three days to make new fabrics to use as book cloth for my watercolor journals. Over the last 20 years I learned many surface design techniques for silks and cottons and love to play with dyes and resists to create textiles. In a Manhattan apartment, I need to "schedule" time to play with dyes because I have to get out so many supplies, tools, etc. And our dining room table is covered in plastic for several days as the fabric cures and dries. I purchased 3 new primary color dyes in February and made up new stock solutions. Then when I was "playing" I decided to see if the stamp process I used recently for paper worked equally well with fabric. Here are my stock solutions, the secondary colors I mixed and my new stamp. 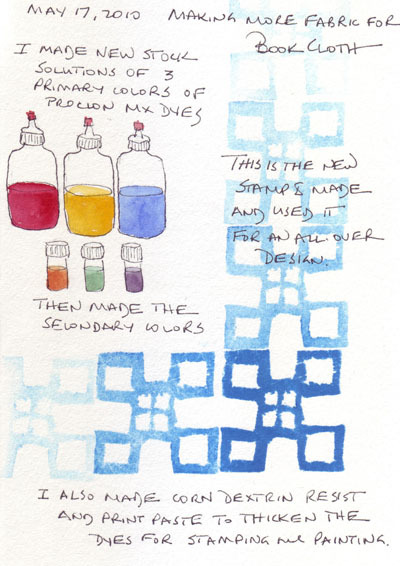 I used it to stamp a dark blue design over an entire piece of dyed blue-green cotton that will be book cloth. 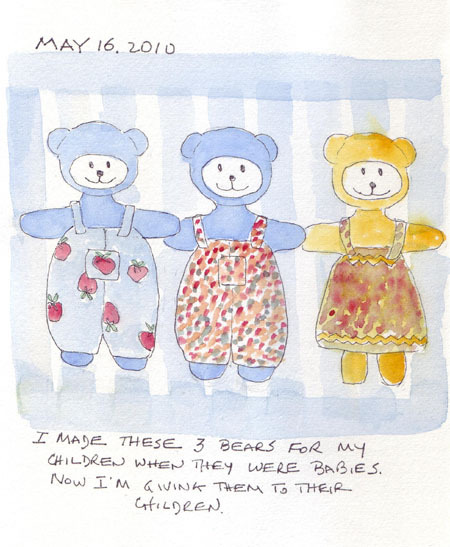 I made these 3 bears for my children when they were babies and they are well worn. I forgot that I had them until this weekend when I was looking for a dress I made for my daughter to see if her daughter could wear it (Sydney is too tall) and found the bears. I gave Sydney the one from her Mom and will deliver the boys' bears to them so their children can play with them. The Metropolitan Museum of Art has a new fashion exhibit called the American Woman. 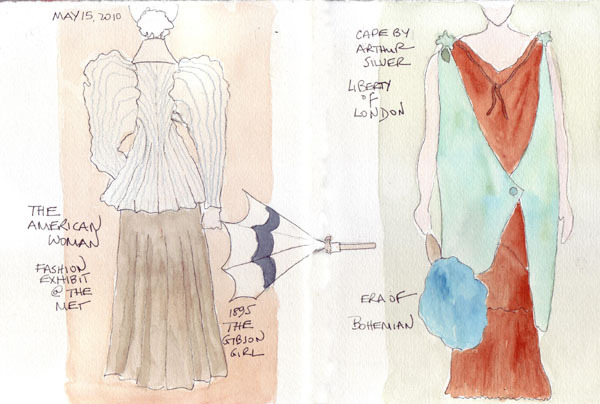 It was crowded, and I sketched two garments quickly and then painted them at home - mostly from memory. The whitish stripe down the center of the page is from Photoshop removal of the gutter between the two pages.